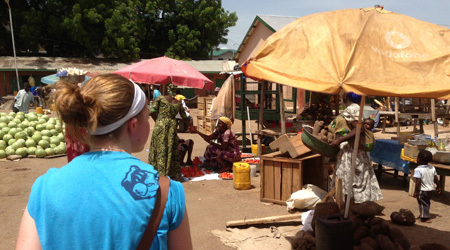 Cross-Cultural Service graduates are serving in countries all around the world. Are you sensing God’s leading to share the Gospel message with people who think and live differently than you? Whether you are preparing for traditional or non-traditional missions, BJU’s Cross-Cultural Service program is designed to deepen your understanding of the Bible, sharpen your skills in cultural integration and relationship building, and prepare you for the challenges of cross-cultural service in the 21st century. The Cross-Cultural Service program encompasses Bible, counseling, missions, language and linguistics, anthropology and more, ensuring that you will graduate with the solid foundation you need for effective service. Equally as important as the classes themselves are the professors who teach them. Our full-time faculty members come from diverse ministry backgrounds, including urban church planting in the United States and mission board administration. Guest lecturers, serving on mission fields such as India, Cambodia, Lebanon, and Micronesia, contribute their unique perspectives and wisdom from years of experience. The capstone of the program is the summer internship after your junior year, when you serve with a veteran missionary on a foreign mission field for a minimum of eight weeks. In addition to your Cross-Cultural courses, you will take the BJU Core, a comprehensive range of liberal arts and Bible courses, including economics, history, philosophy, science and speech. These courses will broaden your horizons, equip you with critical thinking, problem solving and communication skills, and prepare you to be an innovative and adaptable witness for the Gospel wherever God leads you. Many of our students find that business and science courses partner well with their Cross-Cultural Service degree. Business courses help equip you for non-traditional missions, while science courses lay a strong foundation for future medical training, which is highly in-demand in many places around the world. I appreciate now more than ever the quality biblical preparation that I received through the program. The doctrinal classes were foundational for life and ministry, and the practical classes have daily application. My wife and I knew that we wanted to be missionaries to Peru, thanks in part to good counsel from teachers and missionary guest lecturers as well as the months spent in Peru during my missions internship. The men who came in from the field to teach and counsel us during the block classes were a highlight of my time at BJU. Also because of the missions program, we had already been able to think through and compare different mission boards and make a critical decision about who we could best work with. God used the program at BJU to prepare me in many ways for the mission field, not the least of which is a dependent confidence on the authority of God’s Word. I serve along with my family in the jungle of Peru where we have been for over 6 years, with the long-term goal of reaching the unreached people groups of Peru. The linguistic courses which the program offers should be of great benefit as we learn an unwritten dialect. I appreciate now more than ever the quality biblical preparation that I received through the BJU missions program. The doctrinal classes were foundational for life and ministry, and the practical classes have daily application. I will always be thankful for the godly and experienced men and women who gave of their lives to prepare me for God’s work. At BJU you will have extensive access to missionaries from all over the world. Whether it is Missions Emphasis Week or one of the frequent missionaries who speak in chapel, you will be able to meet and connect with missionaries from all around the globe. The Office of Missions can assist you in finding positions for Christian service. In addition, our Career Services Office can help you connect with mission organizations and mission boards. The capstone of the Cross-Cultural Service program is the summer internship, when you serve with a veteran missionary on a foreign mission field for a minimum of eight weeks. This internship is designed to give you a preview of both the challenges and the blessings of presenting your ministry, raising support and living on the field. More then 80 students have interned in 37 countries, including Hong Kong, Cambodia, Cameroon, Ecuador, England, Israel, Papua New Guinea, Vanuatu and more. Whether or not God leads you to return to your place of internship for full-time service, the cultural and spiritual lessons you learn will be invaluable. Five missions classes are offered in block format, covering a wide variety of topics: Practice of Cross-Cultural Ministry, World Religions, Women in Missions, Cross-Cultural Discipleship, and Current Issues in Missions. These block classes are taught by Mr. Mark Vowels as well as by veteran missionaries who serve around the world from India to the Marshall Islands, and from Albania to New York City’s Jewish community. Throughout Missions Emphasis Week, veteran missionaries are invited to speak in chapel. Around 60 mission boards and outreach organizations attend, providing students the opportunity to ask questions, discover ministry possibilities and make contacts for the future. Faculty members come from diverse ministry backgrounds, including urban church planting in the U.S. and mission board administration. Guest lecturers, serving on mission fields such as India, Cambodia, Lebanon, and Micronesia, contribute their unique perspectives and wisdom from years of experience. Each fall, faculty/staff-led mission teams are formed and students begin to raise financial support. The teams prepare throughout the school year and then begin their summer outreach using trade skills, music, teaching and preaching to spread the Word. Recent teams have gone to Southeast Asia, Australia, Europe (Musical), the Western U.S. (Trade), Alaska, Korea, Brazil (Soccer), Mexico and Africa. Cultivate ability to communicate biblical absolutes within diverse cultural environments.